Your team is always courteous and helpful no matter how big or small the job is. I will recommend your company to anyone who is looking for a good mechanic. 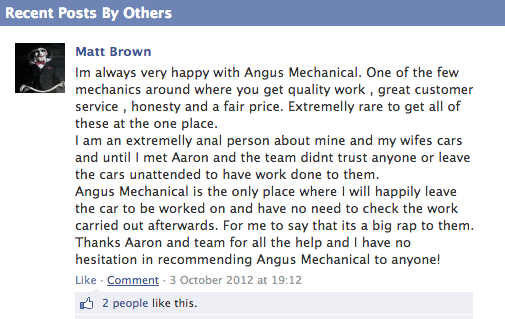 We appreciate the promptness and thoroughness of the service we receive from Angus Car Service. This was especially evident when we had a vehicle that had been repaired twice by another mechanic but still had a water leak and Aaron was able to find the leak and have the vehicle back on the road with minimum downtime.